A new stand-alone programmable MIDI controller has been created called the Tabstrummer, which is half guitar and half keyboard. 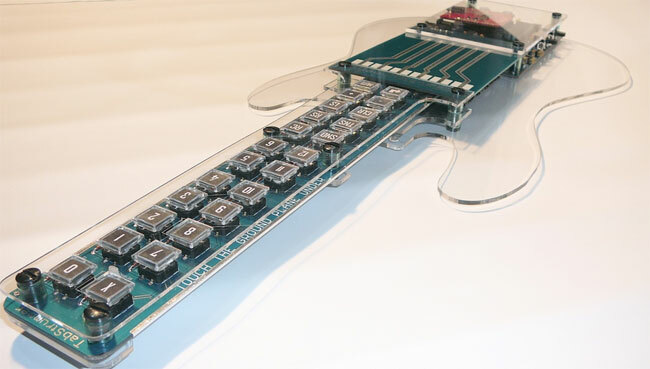 Its allows chords to be programmed into it and then played back at the press of a button. The Tabstrummer has been built using a Atmel microcontroller and features a MIDI output as well as an audio-out jack. Watch the video after the jump to see the Tabstrummer in action. The Tabstrummer is equipped with 12 memory buttons that can be programmed with any chord/tab that can be played on a 12 fret guitar, and all the 12 memory buttons can be programmed into any of the 300 memory SONG locations of TabStrummers internal memory. Its also equipped with PCB traces for strings and a MIDI out connection and MIDI sound shield with onboard audio out jack, enabling you to use headphones or connect it to your sound system or TV.